I know this has been a long time coming, but getting my skincare routine down isn’t that easy because: 1. I rotate so much, for instance, I go between 3 cleansers every week (exfoliating, foaming, & daily) and I go between 3 moisturizers based on the level of hydration I need and how they layer with other products 2. I am constantly sampling new products. 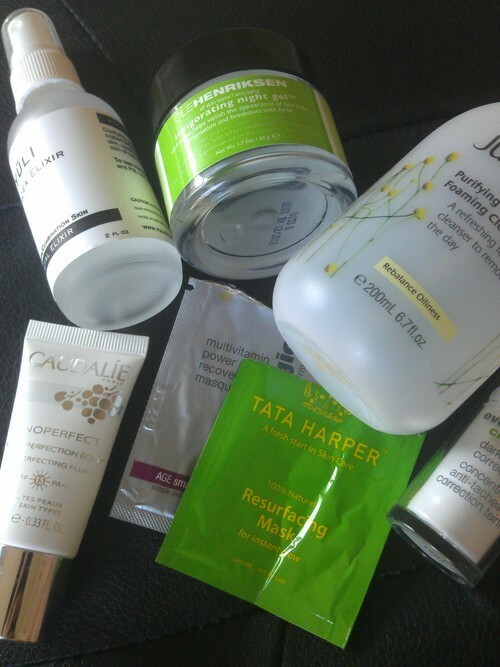 Due to my job, I have a lot of samples at my disposal, some I write about, some I don’t (obviously not clean brands like La Prairie, La Mer, etc.) 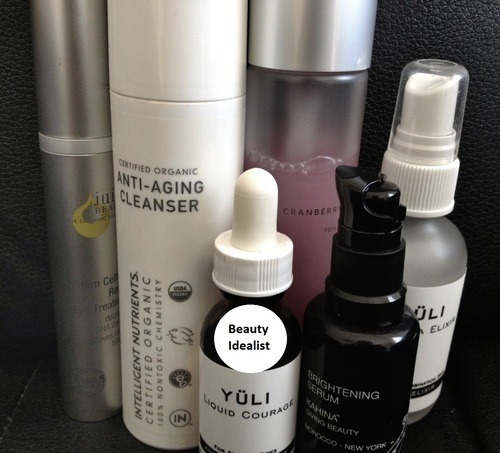 – so I generally use those products to take care of the “nonessential” skincare products. Arcona Cranberry Toner: This is my pre-cleanser product since the Intelligent Nutrients Cleanser doesn’t really remove a lot. I apply 2-3 pumps of this to a cotton pad and remove “the day” from my face. I don’t use this in the morning and when I do use this at night, I follow up immediately with the cleanser because I’m kind of convinced the EO’s and fragrances in here are going to be irritating to my skin if I leave them on for long. Be sure you wash this off your skin because there are foaming agents and alcohols in here that are not good when left on skin for a long time, that is why I use it right before I hop into the shower with my cleanser. The scent is also something you’ll love or hate as it has staying power – I found it ok but a bit much. Another alternative I’ve been substituting is pure Jojoba Oil, but that is more like an oil-cleanse that the Intelligent Nutrients cleanser cannot “eat” through – so I reserve it as a once a week ritual. Intelligent Nutrients Anti-Aging Cleanser: I find that in the winter, I do not need cleansers that “remove everything” because my skin tends to feel stripped afterward, leading it to over-produce sebum. I’ve been using this cleanser because it is actually more like a lotion that you apply to your skin. It doesn’t strip skin at all, in fact there is no foaming action at all, only the feeling of the cream sliding through skin. Before you ask when a cleanser would have anti-aging benefits since it is only on your skin for such as short amount of time, let me explain: what it lacks as a actual ‘cleansing’ agent, it makes up for in the nutrients department. This feels more like a skin conditioner than a real cleanser because most of what I rub around my skin isn’t even washed off, it seems to be absorbed by skin! You know when you massage a cleanser into skin and give it a while to do its work sometimes? If you do that with this, I’d say about 60%-80% of the product will be absorbed by skin. For ordinary cleansers that are loaded with foaming agents, emulsifiers, alcohols, etc. this may be a problem but the natural, mostly organic ingredients in this cleanser will only make skin better. I really like the wonderfully healthy ingredients list that boasts food-grade ingredients such as Apple Juice, Pumpkin Oil, & Cranberry Oil. I don’t think this is a good product it you’re really looking to remove a lot of make-up or grime/oil from your face, but it is wonderful for low-maintenance dry skin or winter skin that doesn’t need another round of detergents. As a bonus the plant oils in here leave skin glowing without creating congestion. For those of you with oily or congested skin, I actually recommend this cleanser over a lot of other cleansers (even those that may foam) because this is not formulated with any waxes so it is a lot lighter on your pores. YULI Panacea Elixir: A staple product. I apply this LIBERALLY all over my face right when I get out of the shower to maximize absorption while my pores are most receptive. This is a toner/mist that is designed to treat and hydrate all skin types but particularly those who may have combination skin. The scent is heavenly and addictive, I can’t quite describe it yet except that its so fresh and delightful.I think part of the reason why their products smell so spectacular despite not using EO’s or fragrances, is that everything is made fresh and so pure in batches on their own farm+lab, the quality of ingredients is unsurpassed – just follow their twitter to see pictures they post of the vibrant biodynamic farm they work from! The formula is so pure and made of organic and wild-crafted ingredients including hydrosols and flower waters. There is a lot of research into the nurturing and healing powers of flower waters and after using this elixir, I believe in it 100%. This uses ingredients that are so fresh that they are biologically active which is why they’re so effective at remedying all skin concerns. I noticed that when I stray away from this, my skin becomes oilier and more prone to breakouts. This is hands down, my favorite toner on the market and a regular purchase. Only complaint: MAKE BIGGER SIZES. Juice Beauty Stem Cellular Repair Eye Treatment: I haven’t really appreciated eye products in the past but this eye cream/gel hybrid from Juice Beauty is the first one that really agreed with my skin. It is the right balance: the texture is creamy but doesn’t make you feel like you smeared your eyes in a heavy paste and the product leaves a hydrating presence while still being fast-absorbing. I can say that although I don’t have many eye issues right now, I notice my eye area especially the undereyes where I have the hereditary dark eye circles, look more refreshed and rested when I use this. My eyes feel comfortable and rested, never feeling “streched” like how some products can make it feel. I attribute the results to a combination of the Vitamin C and Fruit Stem Cells and I believe the comfort and hydration can be attributed to the shea butter, aloe, and organic juices. This is also one of the only products that doesn’t sting or irritate my eye, which has been my experience with the majority of products on the market for eye cream ranging from Sunday Riley to vBeaute. I also like the lightweight cream texture because it applies very evenly and absorbs fast so it doesn’t “travel”. Lately I’ve been experimenting with an eye product from a natural beauty company that is a oil that you roll on and every time it gets into my eyes somehow and makes it sting & water. So there is something to be said for a well made cream/gel that can stay in place. Kahina Brightening Serum: I use this to justify all those times I leave the apartment thinking “I don’t need to wear that much make-up” because the brightening serum is kind of like my moisturizer + serum in one. The blend of shea butter, glycerin, argan, and hyaluronic acid in this makes it moisturizing especially after I apply this over the Panacea Elixir. I like the thought that not only is this moisturizing my skin but it is also correcting any possible discoloration. I don’t think I suffer from hyperpigmentation or discoloration, but I feel like we can all use products like these because ultimately the difference between photoshop and non-photoshop for a person with good skin is the tone and eveness, which is what this product addresses. So I like using this with the thought that “it’s making my skin look healthy”. It doesn’t hurt that the actual ingredients truly do make skin better, including white lily, seaweed, and algae extract. YULI Liquid Courage: This is their antioxidant serum which in the day provides protection from UV damage, environment (pollution, exposure), and fatigue, while in the night the antioxidants are at their most active in healing and repairing skin while we sleep. What I like most about this serum is that the key active is called the Botanical Antioxidant Seed Complex which uses pure botanical seeds that are known to contain the densest concentration of nutrients (Vitamins, minerals, Omegas, phytonutrients) and antioxidants. What makes it stand out are the supercharged ingredients like liquified Biofermented Black Garlic extract and chirally correct Ferulic Acid (derived from Acai and Argan) – their ingredients are truly outstanding and second to none. Working in beauty at a high-end dept store, I can say that these are ingredients that are ahead of the curve even compared to the $500 serums out there that use maybe a fraction of their ingredients. Ingredients aside, what makes this serum amazing is that each and every single time I use this, I notice it, especially the morning after I use it night. I had heard YULI say that they developed this product for their friends, professionals who traveled and were jetlagged but had to look like they had the perfect restful night on just 3 hours of sleep, and this definitely gives skin that perfected healthy glow. If you want to see results, use this at night, if you want protection and preventative benefits, use this during the day. I always wake up noticing how bright, smooth, and well cared for my skin looks. They truly are not joking when people say it gives the 8-hr sleep with perfect nutrition look even if you just went through a war. Omorovicza Complexion Perfecting BB Cream SPF 20: The perfect daytime product, SPF 20 + Complexion perfect BB Cream benefits make this a versatile product that both protects from UV exposure (the SPF20 is fortified if you layer YULI’s Liquid Courage under to neutralize sun damage and free radicals). The cream is very light and will only enhance complexion without making face look made up. Expect very natural glow and minimal coverage. Tata Harper Rejuvenating Serum: Great for winter when skin needs more than a facial oil. I love to layer this on as a lotion since it is quite thick for my skin type to be considered an actual serum. The fact that it’s loaded with 29 active ingredients means this is possibly the most loaded anti-aging night time moisturizer I have used, since it was designed to be a serum. The hydration properties are “just right” for my skin, any more waxes and my pores will not like it. I just turned in my last paper and started packing up my beauty products for my trip home, which I always save for last! I realized that especially in winter, lip products become more important to me. Not only will we need the perfect color for the numerous winter holidays, but the dry, cool air will also render lips rough and chapped if left uncared for, so I’ve edited down the products I’ll be taking home with me to survive the numerous demands of the winter Holiday season. 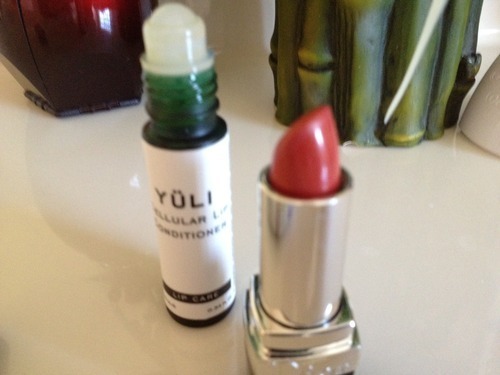 For my base and overall lip treatment, I’ve been using YULI’s Cellular Lip Conditioner which reminds me of Aesop’s Lip Heal which has been a favorite of mine (featured in my July Must Haves post, here). After using both, I have to flat out say, I prefer Cellular Lip Conditioner. The formula is cleaner (all pure plant technology, food-grade, edible, safe for pregnant women), the botanical actives are more high-end and loaded with antioxidants, and the texture is more serum-gel like so it is more nourishing (Aesops is a thinner watery consistency which sometimes tended to dry my lips). The scent uses vanilla as a base and has a exotic ginger lily which is really nice and addicting. It also retails for less than Aesop’s Lip Heal, so I’ve decided to repurchase this when it runs out. You might be wondering why I would bring this over a lip balm – other than the fact that it looks chicer. Up until recently I believed only lip balms could offer that level of nourishment and hydration but Cellular Lip Conditioner is performing really well. I usually wake up with chapped, bleeding lips if I do not apply a lip balm before I go to bed, but Cellular Lip Conditioner has left my lip very soft and plump each time I used it, and it doesn’t have the heavy feel of a balm. The conditioner also really “heals” and replenishes my skin which I find lip balms don’t really do, they tend to just sit at the surface to prevent more damage due to dehydration but don’t really address the damage already done. This is particularly important because I find that I am unable to layer products over lip balms since they’re very heavy and greasy and don’t get rid of damaged, rough skin. With Cellular Lip Conditioner, you can tell YULI truly worked with Make-up artists and stylists on this product because it absorbs fast and makes lips conditioned for flawless application of lip stains and lipsticks that often might accentuate vulnerable dry/rough areas. Anyone who has applied Tom Ford’s pigment heavy lipstick knows what I’m talking about, the rich colors often dry out the skin, so having this conditioner as a base is so important. 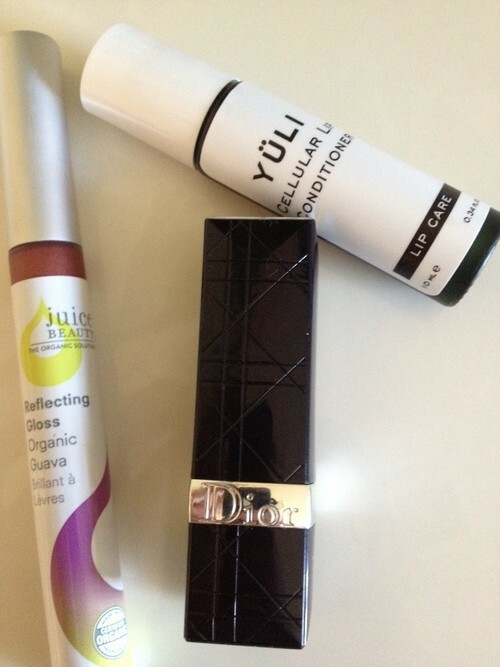 I’m really in love with YULI’s thoughtfully made products and Cellular Lip Conditioner has me hooked. If I’m not going to a party and just want to add some color, I’ve been in love with Juice Beauty’s reflecting lip glosses. They have some sheen but ultimately are very subtle (contrary to the name, this isn’t a super-shiny gloss). There is a very lovely scent – similar to how some lip glosses on the market have a candy/fruity scent, but because this is a very cleanly formulated product I feel safer enjoying this since I know it is nontoxic. The lip glosses come in 4 colors: Champagne, Pink, Fig, and Guava, I have used Pink and Guava. Pink really helps the colors stand out which is cool if you want to brighten up your look, the rest of the colors are more subtle and skin-toned which is what I prefer. Beside just the colors, because it is all natural – a lot of the actives are also good for your lips! For example this contains grape seed oil, strawberry oil, etc. which really nourish skin. And the sweetness to this gloss is added by natural agave leaf extract. One note: for people sensitive to Titanium Dioxide and Citrus oils, you may want to pass this up since it is in the ingredients. However, I really enjoyed using this and did not have any sensitivities. At just $15, I truly believe this is a wonderfully priced product that offers a safer alternative to more expensive glosses from Hourglass and YSL. The YSL gloss in particular sometimes gets me with the smell and gives me a headache. Finally, if I’m going to an event, my current favorite lipstick is Dior’s Rouge Dior Lip Color. In the world of lipsticks, you either have creamy, nourishing lip colors that are subtle and light or you have drying, striking lip colors that are pigment heavy. The Rouge Dior line offers a “manageable” medium for me between color saturation, wear time, and drying capacity. On the driest lips, this will accentuate roughness, edges, chapped skin. But on well moisturized and conditioned skin, the colors look gorgeous and creamy. You can increase wear time by making sure your lips are perfectly hydrated before, which YULI’s Cellular Lip Conditioner really helps with. I really love this combo as I am now able to pull off the heaviest pigmented lip colors/stains with their conditioner. Despite the description, don’t rely on this lipcolor to actually nourish lips, you really need to make sure your lips are doing fine to get the most performance. The staying power is decent and the fade is very even which I loved. The colors themselves are brilliant. Not only do they look incredibly high-end, but they manage to find the balance between being striking without being garrish. The last time I was at Barneys, I noticed a girl shop for lipstick with really gorgeous lips and this beautiful red-orange color, so I had to ask her what she was using. And her answer? Rouge Dior Andalouse. That really affirmed for me that this line is superb. Sometimes you have to see products on someone else before you realize how it works on you. I currently have this in Rare Amber (pictured), and Ara Red. The two colors could not be more different representations of the line: Rare Amber is subtle and has some sheen, very much representing the nourishing soft colors of this line. The Ara Red is the lipstick equivalent of the little red dress: vibrant, striking, and with color saturation for miles. At times it feels like these two colors should be different lines but I love both of them. I know the formula is clean at all, but honestly I love the performance and I don’t wear makeup THAT much so it’s about everything in moderation. I like the performance which is think is more important for makeup products especially since I don’t really live in them and will only wear for about 2-3 hours. As a product junkie, I sometimes try so many things that I fear I may never finish using them before I move onto my next. For me, the end of a product is the best time for me to write a review because it helps me think if I’m going to repurchase, what I’ll miss about it, what I won’t miss. I find that products that seem to have run out ‘too soon’ always tend to be favorites that incorporate into my routine and use a lot and there are products that I have to make a serious effort to use up – at which point its kind of like eating at a buffet, you might go back in the future but for now you don’t want to even look at it! Jurlique Purifying Foaming Cleanser($34): A syrup-like cleanser formulated with tea tree oil and lavender to target blemish prone skin. Other cool ingredients include honey, green tea, grape seed, tumeric, and witch hazel. It really does help to remove makeup and grime but it is a little bit too strong. It foams a lot (more than the natural cleansers I’ve been using) so this is perhaps why it is also a bit drying since foaming agents can lead to that. Unless I follow with a facial oil in the summer, my skin will feel stripped and go into over-production of sebum. The scent was a very strange botanical scent, not that relaxing but not really a deal breaker for me. I felt like I really had to work to finish this cleanser, but perhaps that is because it isn’t really ‘right’ for my skin type which no longer needs a cleanser this strong. Clinique Even Better Clinical Dark Spot Corrector ($49.50): If you’ve read a few of my past posts on acne scars, you’ll know I didn’t really see results with this serum. Instead it aggravated breakouts on my forehead so I could not really use it. It has been a challenge for me to finish using but since I didn’t want to waste it, I ended up applying this around a few sunspots on my arms since my face has cleared up significantly with this product from YULI. Not sure if Clinique really did anything for those sunspots but just glad to have finally used this all up. Scent is a chemically, fluid is a milky cream gel. Tata Harper Resurfacing Mask ($55): Most of the products in the Tata Harper line are not suitable for my skin type and tend to be too heavy on my pores. However, the resurfacing mask is perfect. It is a gorgeous amber hued gel that smells like a spa. It resurfaces skin but is delicate enough for sensitive skin. I did not get any redness and my skin felt so hydrated and nourished after using it. I can safely keep this on my face for an hour before washing off and my face will just glow. I used up my sample in 4 days because I was so addicted to the mask, just ordered a full sized jar. Dermatologica Multivitamin Power Recovery Mask ($46): I’m not a huge fan of Dermatologica but I received a sample of this from a Beautybar order. I know their products aren’t completely clean but I love any mask that focuses on nourishing skin with vitamins, antioxidants, etc to relieve stressed skin. The mask is a white cream that looks like a lotion at first but once you apply it, you can really feel this layer on your face. Skin just feels ‘injected’ with moisture and looks soooo well rested when you wash it off. If the formula were cleaner, I would not hesitate to buy the full sized product but since it is not, I chose to spend my ‘mask’ money on Tata Harper. Caudalie Vinoperfect Day Perfecting Fluid SPF 15 ($72): I had read a lot of great things about how this product is the perfect balance between moisturizer + spf + light coverage foundation. When I got my hands on this, the first thing I noticed was how silky and fluid the consistency was – lighter than most moisturizers and foundations I’ve used. The scent is like heaven, but I know they use a synthetic fragrance to achieve that. It absorbed fast but you do need a lot of this product to feel it moisturize. I don’t really see much coverage but this product is virtually weightless. I just wish the SPF could be higher, or the coverage could be a bit more but this isn’t a bad product by any means. I will definitely consider buying this if they could make a SPF 30 variant even if it is not as light weight. YULI Panacea Elixir ($36): Remember how I said some products you just always run out of? This is one of them. If I was paid a dollar every time I sprayed this, I could probably buy this product over and over every day. I’m a stickler for scents and the most recent batch from them just smells GORGEOUS! Whenever I feel a breakout about to come out, I just spray this over my face at night, massage all over and go to bed – it seems to detoxify all the junk out over night. It also cleans out my pores and makes my skin look way better than it genetically should. I also use this after workouts and it keeps my face really hydrated. There is no alcohol in this so it doesn’t dry out your skin. And I found that facial oils and moisturizers sink into skin faster after I apply this product. This has become such a staple in my regimen. Ole Henriksen Invigorating Night Gel ($45): I think I said in the Sunday Riley Good Genes review that this is a cheaper, less refined, but more active version of the same thing. Truth be told, this is actually my boyfriends product but I use it too. I notice that it is way too strong to leave on overnight as the instructions say. I tried it once, and I looked like I had been laying out in the sun all weekend with no sunscreen. With that said, if you want a clean, acid peel this is a great product. It really allows your skin to start fresh. It is a clearish-green gel with a slightly slightly acidic scent. Not too sure if I would purchase this product again – there are a few clean acid peels and resurfacing products out there so I will probably test some, but this is still a very solid option.